Amidst an unending stream of visitors, huge cartons of brand-new home appliances and plates full of sweets, Nisha Sharma sits resolute inside her suburban home. This is the young woman who called off her wedding at the eleventh hour because of unreasonable dowry demands. She has already been awarded by the government and some NGOs for her brave act; and has almost become an icon for the anti-dowry movement in India. While Indian women continue to be victims of dowry harassment (the National Crime Bureau reported 6,995 recorded dowry deaths in 2000 across the country) Nisha's case is inspiring many women to say 'No' to dowry demands in arranged marriages. In Delhi, where the Crime Against Women's Cell had registered 1042 molestation and dowry harassment cases by April 2003, Nisha's feisty act emboldened two young brides, Farzana and Anupama, to call off their marriages at the last moment. Nisha's guide and inspiration, father Dev Dutt Sharma, taught her that "It is better to light a candle than to curse the darkness". At her small and sparse home, and in-between interviews, Nisha listens to a weeping young woman with a child who has been thrown out by her in-laws. The woman was first abused by her in-laws and then by the police when she lodged a complaint of dowry harassment. Nisha promises to speak with her newfound friends in the Mahila Dakshata Samiti, an NGO working against dowry harassment. At 21, she sounds poised and mature, displaying immense patience in telling her story again and again. "I get calls until 1 am and the house is full the whole day." But she feels completely vindicated about calling off the marriage at the last minute and is fully appreciative of the media and public support. As in most arranged marriages, Nisha met Munish Dayal (the rejected groom) along with his family in March 2003. The Dayal family initially declared they didn't want any dowry. But when Nisha's former boyfriend, Navneet Rai, talked about their relationship to them, they started blackmailing the Sharmas by extracting expensive goods. Obviously, they felt the Sharmas could be crushed into submission because of the 'affair' they had learned about. Nisha's software engineering degree would in the future give her an edge over Dayal, who was only a computer teacher in a school. But no one pointed out this apparent anomaly when his family bargained about presents with Nisha's family. Apart from an expensive car and home appliances for the couple to be wed, Nisha's father was made to buy home appliances for Dayal's elder brother too! Nisha says she was unaware of her parents being so harassed, a process that escalated five days before the wedding. On her wedding day (May 11, 2003), the harassment reached a crescendo - the Dayals demanded Rs 1.2 million (US $1=Rs 47.5) in cash. Nisha's father tried to talk them out of their latest demand but was hit and spat upon, minutes before the wedding ceremony was to begin. When her younger brother told Nisha that her husband-to-be and future mother-in-law had assaulted their father, she couldn't accept this insult and immediately called her father on the cellphone, saying she wouldn't be getting married. "I just called off the wedding and then myself called the police." It was a spot decision and she took it. The Dayals were arrested and till mid-May had not been granted bail. Last-minute dowry demands are not rare in Indian weddings. However, most girls go along with the wedding, hoping things will improve, instead of calling it off and facing social embarrassment. This is not the first time that Nisha had to make a choice between her own dignity, her family's honour and social conventions. Her former boyfriend, Rai, was all set to marry her but decided his future father-in-law should first find him a job. 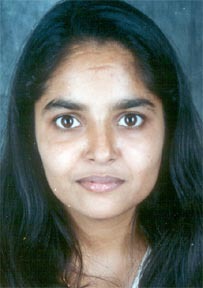 Seeing his grasping attitude, Nisha broke off with him; and a few months later, her parents found Munish Dayal for her. Rai, a college mate, was apparently suspended from the college when Nisha complained against him. Part of her recent marriage fiasco seems to have occurred because Rai badmouthed Nisha in front of the groom's family, who then decided to ask for a bigger dowry. In conventional Indian marriages, news of the bride having a boyfriend often spells doom. "I cannot and will not stand anyone exploiting or offending my mother, father or brother," says Nisha. The close-knit family has always stuck together; the children groomed to be upstanding and studious. No Ekta Kapoor or saas-bahu serials here. "We let them watch only Discovery, National Geographic and `Zindagi ki Kasauti'," says Nisha's mother Hemlata Sharma. Her children were not encouraged to socialise outside the home and took permission for every action, she added. Nisha appears to have no conflict at all with this conservative upbringing; she wasn't given to a glamorous lifestyle, make-up or trendy clothes that urban youngsters today are generally drawn to. "We preferred our children to be simple and modest," says her mother. Further, says Nisha, novels, newspapers and books - which could have been a subversive element in her growing years - never interested her. "I have never had time for anything other than my studies," she declares. The lack of any visible conflict between generations is almost disappointing. Nisha keeps repeating: "I'll do whatever my parents/father want me to." And whenever she does get married, once this nasty episode is behind her, she intends to let her new family decide the course of her life. This includes letting her future husband and his family decide whether she would use her software engineering degree to get a job or not. Would she be prepared to let her parents give a dowry again? Yes. "Tomorrow, if we are thrown out of our marriages, at least we would have these valuable things," she says, echoing the sentiment rightly or wrongly shared by many young women today. She may well seem to be like any other security-seeking conformist but Nisha is definitely very different from her mother's generation. "Nisha was the kind of child who would beat up rather than get beaten up in school," says the proud mother. According to her mother, Nisha's empowerment might be the result of a relatively better education and the accessibility of technology (the handy mobile phone, for instance, that gave her daughter the means to call off her own marriage). But the real difference between Nisha and an average Indian girl is that Nisha knew (or knows) when to assert herself. She used her courage to protect herself from near-certain destruction. If she'd gone through with the marriage, she would have been like countless other Indian women suffering bad marriages. By giving herself the power to say 'No', by making a choice on her own terms, Nisha has lit the proverbial candle her father taught her about. She has inspired countless other young women - on how to stop a bad marriage before it starts. Regarding this Government makes strict laws and make helpful NGO for girls where judiciary judgement is allow.